James Lovejoy’s début novel is an impressively researched, charming story about a young man coming of age in 18th century London. As a portrait of lower-class strife, the story has the feel of a Dickensian tale with added subject matter on how gay men might have lived centuries before homosexuality was decriminalized. Joseph narrates his own story, and he gets off to a compelling start with a childhood that sounds as sordid to the reader as it seems quite normal to the narrator. His father was a “waterman,” ferrying passengers on the Thames, an occupation that afforded their family of five plus a grandmother a two-room flat in a crowded renthouse. A fever made worse by the misguided medical treatment of the time takes his father’s life. In a delightfully curious turn, his mother re-enters the boxing stage to make ends meet. Women’s boxing was in fact a thing in 18th century England, and no less desperate and brutal than the men’s sport. Joseph’s mother holds her own for a while, but seduced by a big prize with an overmatched opponent, she’s walloped with a head injury that leaves her bedridden and wasting away. Upon her death, the siblings are separated, the older brother sent to apprenticeship and Joseph and his sister to gender-segregated orphanages. Amid many discontents at his austere, religiously oppressive home for boys, Joseph meets a youth nicknamed Chowder, and a tender love affair blossoms between the two, which becomes the story’s backbone. They’re thwarted by a bitter and exploitative schoolmaster Mr. Peevers, and thereafter by geography and Chowder’s cruel caretakers. Lovejoy does not spare the two from the miseries one would expect them to encounter as penniless young men whose attachment is considered so despicably criminal and sinful, the word for it is not even spoken in decent company. Yet their love is handled as a very sacred thing, such that the reader is fairly assured things will end well. That treatment gives the story appeal to romance readers, while perhaps playing it too careful for others. Joseph and Chowder sparkle as chaste lads sworn to one another, an attractive motif for sure given all they’re up against; yet amid the tremendous stakes for gay men to declare themselves at the time, one wonders of the internal struggles that would complicate their relationship as well as the reasons so many of their kind rally around the two. Joseph’s world enlarges as he meets several kinds of gay men: the benevolent Mr. Jackson, who owns a bookshop where Joseph apprentices; the flamboyant Mr. Duckworth, whose aristocratic pedigree provides a buffer to persecution; angry, jealous Rowland, Mr. Jackson’s “adopted son” and younger lover; and a network of businessmen and wealthy folks who eke out bargained lives, carefully protected from the anti-sodomite hysteria of the day. There’s even the suggestion of a nascent protest movement against the many injustices these men face, furthering the narrative’s tone of hopefulness. Lovejoy writes with an enjoyable sophistication that gives texture and an earnestness to Joseph’s tale. Moreover, the period colloquialisms and turns of phrase add wit and a lovely sense of atmosphere for a very British-styled story. 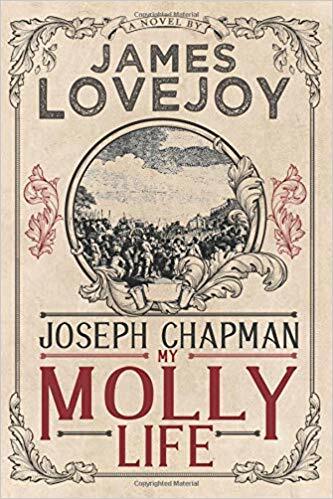 Joseph Chapman will enchant readers of British historical fiction and romance in the traditions of E.M. Forster and Sarah Waters. I;m looking forward to reading your book — which I can easily order from Amazon. Life’s good for me. I am a resident in a fine retirement community just next to Harborview Hospital. Still dilly-dallying about FUTURE CHRONICLES. WE WILL GET IT IN PRINT. Many other aspects of my life are also good. It is about a ten minute ride to Benaroya Hall for Symphony concerts and tickets for seniors are often free for the asking.